VERSABALL® Grippers utilize Empire’s proprietary granular jamming technology to achieve flexible and adaptive gripping through rapid hardness modulation. On this page you will find information on our currently available products. 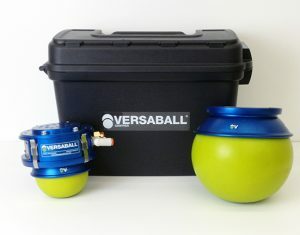 The VERSABALL® Research Kit is suitable for testing and evaluation of real-world applications in advance of our full commercial product release. Performance specs can be found on page 5 of the User Manual. Research Kits are not intended for full time deployment in industrial applications, as the performance specs cannot yet be guaranteed and we are unable to support ongoing head replacement at this time. To purchase a VERSABALL® Research Kit, request more information about our products, or inquire about potential applications, please contact info@empirerobotics.com. How Does a VERSABALL® Gripper work? VERSABALL® Grippers utilize a technology known as granular jamming to grip and release objects through rapid hardness modulation. You can see this same effect if you buy vacuum-packed coffee at the grocery store — hard as a brick until you release the seal, whereupon the particles will flow more like a fluid. In a VERSABALL® Gripper, we leverage this phenomenon by encasing a granular material in a flexible balloon membrane and controlling the internal air pressure as shown below. Once an object is gripped, the vacuum inside the gripper seals so the object can be transferred without additional expenditure of energy. Holding forces on an object are generated through a combination of three separate mechanisms as shown below. Shown on the left, friction forces from pinching are the most common. These forces develop during the small volume contraction that occurs when the gripper is vacuum-hardened. In the center, entrapment or capture of the object can occur if the gripper can wrap around some geometric feature. This mechanism is less common, but can increase holding force dramatically when it occurs. Finally on the right, a vacuum-suction force can develop in the sealed gap that forms between the gripper and a smooth object. This mechanism is also less common, but can provide dramatic increases in holding force as well. When it’s time to release the object, pressurized air is applied to soften the gripper once again. Read all about how to program and use a VERSABALL® Gripper in Section 8 of the User Manual. We’re happy to run feasibility tests on your parts at our lab in Boston. Please feel free to mail us your parts and we’ll run some VERSABALL® gripping tests for you. We offer two levels of testing: a free feasibility test that includes a quick video and some remarks from one of our applications engineers; and a paid level where we quantify specs for your specific parts. Please include your contact information when you mail your parts, and we’ll follow up to determine what kind of testing you need. Our customers are our number one priority, and we pride ourselves on providing them with excellent service and an excellent warranty program. Our approach is simple: (x) if there’s a problem in the design or workmanship in your VERSABALL® Gripper, or (y) if your VERSABALL® Gripper fails when used for the tasks it’s designed for in accordance with the product manual provided along with it, we’ll fix it or replace it in order to solve the problem as quickly as possible. Please let us know if you are not 100% happy with your VERSABALL® Gripper. If you are unsatisfied with the performance of your gripper, we’ll refund your purchase in full. Contact support@empirerobotics.com, and we’ll make sure your VERSABALL® Gripper works for you. 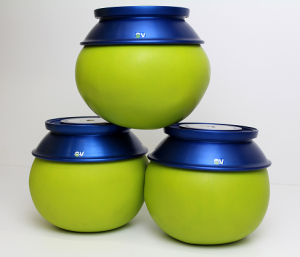 If you own one of our older VERSABALL® products, please click here for more information.